Very tasty with most fruit juice or with lemonade. Make sure to add ice or serve straight from chiller as it is definitely better cold. This was my holiday drink! It's lovely with orange juice. 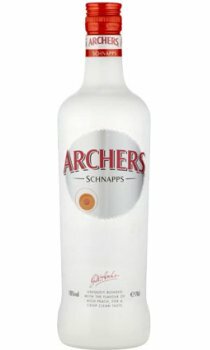 Archers and lemonade - MY DRINK. Luvvvvv it!! Extremely sweet schnapps, in fact it's TOO sweet. If you're going to be drinking it at all it has to have to have been in the freezer for at least an hur, otherwise it'll be awful. . It's just so lovely on its own! This is delicious with cranberry juice.